Create your individual date stamp - with date size of 4 mm! The reliable self-inking rubber stamp with an integrated ink pad that can be personalised with your own design. 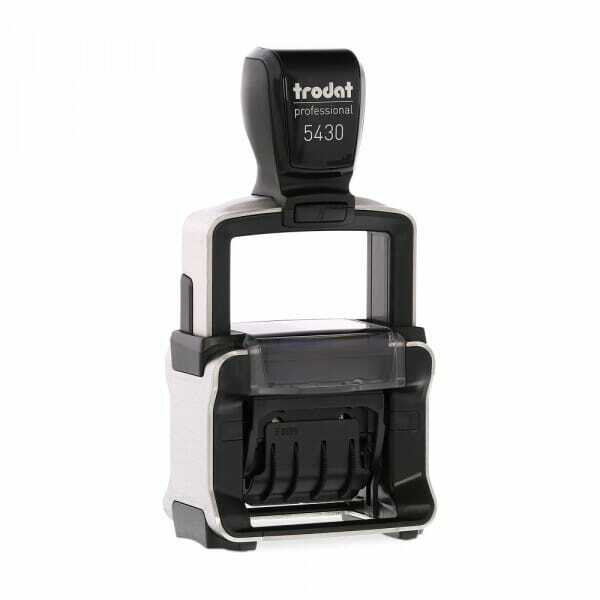 The new Trodat Professional 5430 Dater self-inking stamp is perfect for everyday use in a busy office environment thanks to its new brushed stainless steel finish and high quality plastic build. 5430 self-inking rubber stamp can fit up to 2 lines of customised text, 1 above and 1 below the date. The date band includes date, month (in letters and 12 consecutive years. The date is easily set by turning the date bands, creating an impression of blue text and red date. It is environmentally friendly, produced from a high content of recycled plastic. To further extend the life of your stamp, order the suitable replacement ink pad 6/50/2 blue/red or single coloured pads 6/50 available in black, blue, green, red and violet. They are packed in 3 pieces in a convenient blister. Customer evaluation for "Trodat Professional Dater 5430 1" x 1 5/8" - 1+1 lines"